Samsung Electronics Co., Ltd., a world leader in advanced semiconductor technology, today announced that its 5-nanometer (nm) FinFET process technology is complete in its development and is now ready for customers’ samples. By adding another cutting-edge node to its extreme ultraviolet (EUV)-based process offerings, Samsung is proving once again its leadership in the advanced foundry market. In addition to power performance area (PPA) improvements from 7nm to 5nm, customers can fully leverage Samsung's highly sophisticated EUV technology. Like its predecessor, 5nm uses EUV lithography in metal layer patterning and reduces mask layers while providing better fidelity. Another key benefit of 5nm is that we can reuse all the 7nm intellectual property (IP) to 5nm. Thereby 7nm customers' transitioning to 5nm will greatly benefit from reduced migration costs, pre-verified design ecosystem, and consequently shorten their 5nm product development. As a result of the close collaboration between Samsung Foundry and its 'Samsung Advanced Foundry Ecosystem (SAFE™)' partners, a robust design infrastructure for Samsung's 5nm, including the process design kit (PDK), design methodologies (DM), electronic design automation (EDA) tools, and IP, has been provided since the fourth quarter of 2018. Besides, Samsung Foundry has already started offering 5nm Multi Project Wafer (MPW) service to customers. Samsung foundry’s EUV-based process technologies are currently being manufactured at the S3-line in Hwaseong, Korea. 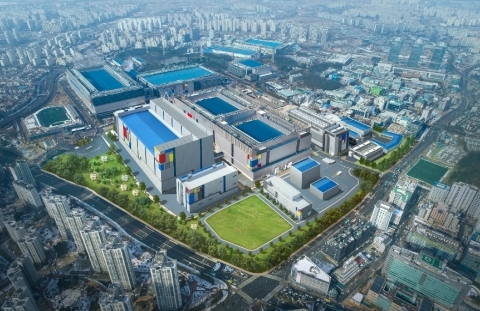 Additionally, Samsung will expand its EUV capacity to a new EUV line in Hwaseong, which is expected to be completed within the second half of 2019 and start production ramp-up for next year.